Daydreaming outside surrounded by summer breezes. Cool night drives with the windows down. Rainy Saturday mornings curled up on the couch. All of the above are acceptable and ideal scenarios for listening to Milo Greene’s self-titled debut full-length album. I have been anxiously awaiting the release of this album since the first time I saw this video – a true representation of the band’s ability to effortlessly create a concept that’s unmatched right now. The original three college classmates evolved into a LA-based quintet that will catch you off guard with their unmatched sound – backed by just enough throaty sound and instrumental depth to pack plenty of emotion. I can’t help but hear a touch of Local Natives’ distant yet euphoric harmonies accompanied by clattering drums and reverbed guitars along with hints of Fleet Foxes’ ability to transport you away from the everyday and into a pastoral dreamland with honest poetic lyrics sung by lush and natural voices. Add in a dose of Of Monsters and Men’s propelling, catchy lyricism and you have the making of a band that is sure to be adopted by the masses looking for a perfect summer soundtrack. This album has been on repeat in my car, house, office, and headphones since it was released last Tuesday and there’s still no sign of boredom. Each track offers something unique, whether it’s a track like Son My Son with the perfect pitch of Marlana Sheetz’s smooth vocals or one of the various instrumental tracks that offer seamless transitions like Polaroid. The harmonies Milo Greene create are hypnotic and seem perfectly described by the Autumn Tree lyric “now I’m off to dream” as the distant melancholic voices build, surrounded by innovative drum work and acoustic guitars. Perfectly Aligned perfectly features Milo Greene’s wind-swept sound that builds to a drum-led anthem. The development of sound from track to track can carry you through a range of emotions like few albums can. It’s neither happy nor sad – it’s a perfect in-between to match any day. I have finally found my solution to the rut of same-old-same daily soundtracks and have found an intriguing album that will take me from summer to fall to winter to spring on light-hearted harmonies and rich sounds that can be paired with any day, mood, or season. 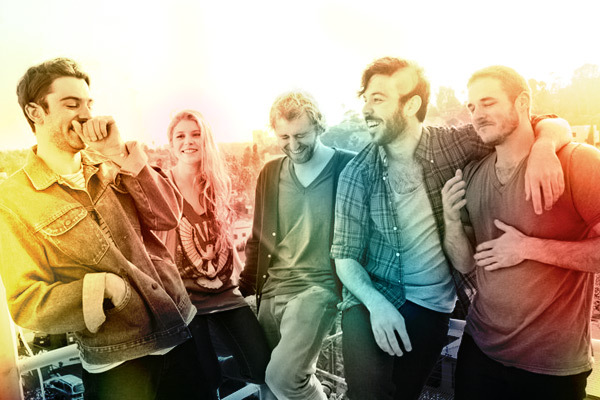 Milo Greene is on to something and I’m anxious to see where their talent takes them. Tonight’s appearance on The Late Show with Dave Letterman certainly shouldn’t hurt their chances of breaking out in a major way. Once a year, in a 700-acre field in middle-of-nowhere Manchester, Tennessee, tens of thousands of people come together for all corners of the country to experience music in one of the most unique ways you could imagine. Days at Bonnaroo are packed with people from every corner the country (even some international visitors), hot sun, tightly packed camping, dust and dirt (and if you’re lucky, some mud), food trucks, lines for just about everything, and your choice of 150 impressive performances spread between 10+ stages. Add to the list art, green grass, a mini film fest, dancing, comedy acts, meeting and bonding with complete strangers, some of the best people watching you could ask for, lights, a water slide, crowd surfing, and did I mention music? Yeah, there’s some of that. This past weekend I joined 79,999 other music loving Bonnaroovians for the ultimate bucket list event. Personally, I never dreamt of going to Bonnaroo until the day I got an invite to volunteer a few hours each day in exchange for a free pass. (Advice: if you have never gone, or even if you have, consider volunteering. There are tons of options/times so you can manage to get in free and still see all the performances.) The idea of 80,000 people in that kind of environment wasn’t at the top of my list, or even on my list at all. Boy was I proven wrong – well played Bonnaroo, well played. The performances I saw in just two of the four days included some of the best I have ever seen. Blind Pilot, Punch Brothers, The Roots, Red Hot Chili Peppers, Gary Clark Jr. – each and every performance was an impressively energetic display of amazing talent. I found myself grooving and singing along to some while others left me literally speechless (in the best way possible). The undeniable power of music is something that I’ve always loved and been extremely aware of, but Bonnaroo took it to a whole new level. 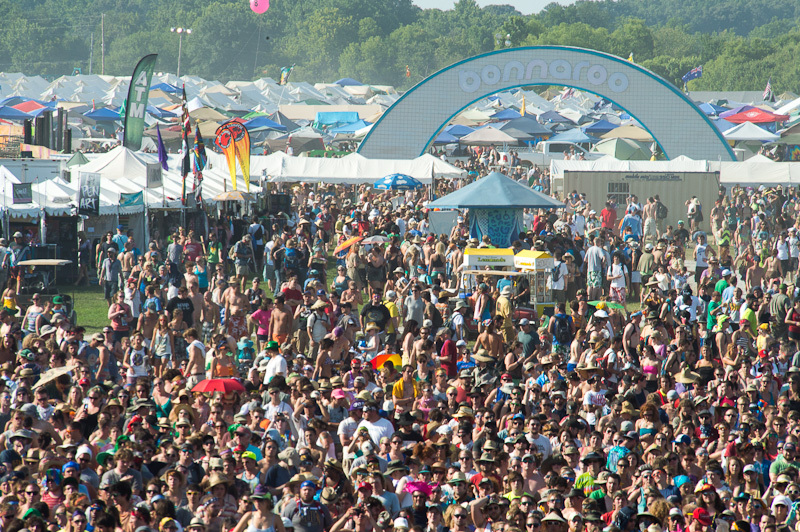 Whether it’s bringing thousands of strangers together to watch one band on a stage in the middle of a field, silencing a crowd with raw talent, or motivating a girl to crowd surf across hundreds of people for the first time, Bonnaroo is a place where music overwhelms you with a feeling of freedom and energy. There’s something about getting away from the normal day-to-day and being surrounded by limitless music that will give you a new appreciation for the songs you hear and the life you’re living. Even though I missed two days of incredible lineups on Thursday and Friday (including Radiohead, Feist, Needtobreathe, The Avett Brothers, Dawes, and more), my favorite performance from Saturday and Sunday hands down was Bon Iver. It’s hard to sum up with words what I saw and felt at that performance. My friends and I were lucky enough to secure a spot in line for the main stage that guaranteed we would be front and center on the fence. I knew it was going to be a great show, but I had no idea how incredible it would ultimately be. The talent of the nine musicians on that stage literally left me, and at points the entire audience, silent. There was a giant grin spread across my face the majority of the show hoping that Justin Vernon would play through the night. Each member of the band was intriguing. Two drummers, some band members switching between multiple instruments, the tricks behind some of the sounds you can so easily overlook when listening to Bon Iver’s album – all these things made for a phenomenal display of beautiful music in a completely real form that I won’t soon forget. When Bon Iver left the stage I was tempted to end my Bonnaroo experience there. There was one more show I planned on going to and I suddenly felt like nothing could top what I just witnessed. But, my friends convinced me that fun.’s show would be the perfect energy-packed performance to wrap up our epic weekend. They were right, and the show had a few surprises of it’s own. There’s no denying the band lives up to their name with their stage presence. As the show was wrapping up, a few of my friends decided it was the perfect chance for some crowd surfing. I watched as they all took turns getting lifted up and disappearing to the front of the crowd over the hundreds, maybe thousands, of people in front of us. Initially I didn’t think twice about holding my place with two feet on the ground, but suddenly it hit me – I was at Bonnaroo. If I was going to do this anywhere, it was here and now. When I finally spoke up and mentioned I was considering it I was convinced the band was on their last song and thought I’d missed my chance. Luckily my friend wasn’t going to let me back out that easily and when fun. started playing We Are Young I knew that was it. I threw down my bag and kicked off my shoes. “Let’s go.” Before I knew it I was floating over the crowd looking out across the endless mass of people all belting out the perfect soundtrack – tonight we are young, so let’s set the world on fire, we can burn brighter than the sun. Pretty incredible. Only at Bonnaroo would this girl decide to crowd surf for the first time. I guess music will do that to you. That’s a memory that I will never, ever forget and I can’t think of a better way to end my first Bonnaroo experience. Thanks, Bonnaroo, for laughs, sunshine, volunteering, people-watching, dirt, mud, donuts, nature, adventures and one of the best music experiences I’ve ever had. I’ll be back and I think there might be a few first-timers coming with me. When faced with death and loss, we often make changes, take on new outlooks on life, and seek comfort. For singer-songwriter Quinn Erwin, losses in his life and in the lives of others close to him, encouraged a change of direction musically, one that turned towards celebrating this undeniable part of life. The indie-rock band based in Nashville blends honest wisdom with a sound that is sometimes somber, dark and haunting and other times contrastingly triumphant, upbeat and electronic. The lyrics remind us that life is fragile and should be celebrated and that death should be no different. In 2011, the band created a two-part concept album – Death (January 2011) and Rebirth (August 2011). The tracks on Death explore fate, the end of the world and comfort offered by the dying to their loved ones, while Rebirth is made up of songs filled with messages of hope and the beauty of a new life. Tracks like “Death” are complex and build in contrast to the subtle, beautiful imagery found in “Nothing But Love Can Stay.” On Rebirth, the celebration of death is played out, both lyrically and musically. Erwin’s vocals offer a raw and driven sound that is perfectly matched by the band’s often anthem-like performance – especially evident on tracks like Black Woods, White Beach and Cincinnati. Afterlife Parade has also started sharing live videos of a few of the songs on YouTube in an unplugged series. They hope that sharing these songs early will get fans and new listeners excited on the front end of this project before recording begins this summer. Erwin and the rest of the band have always had a passion to make their listeners as much a part of Afterlife Parade as they are, and sharing the songs in the early stages is just another way they are achieving that. If you haven’t already, you’re going to want to join this march towards everything ahead with Afterlife Parade. You can find out more about Afterlife Parade on Facebook and Twitter. Stay tuned as we work on setting up a House Show with them soon! 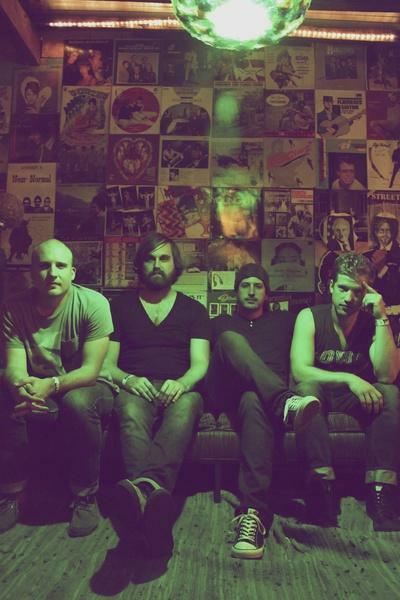 Their self-titled album, released on April 3, will have you hooked from the first listen. The trio’s infectious sound has a rustic charm reminiscent of The Avett Brothers, The Head and the Heart, and even some early Whiskeytown. It’s hard to deny the hand clapping, foot stomping, and chorus shouting that can be heard in many of the tracks. The “heart-on-the-sleeve” stories woven by Wesley Shultz’s lyrics blend naturally with Neyla Pekarek’s cello and Jeremiah Fraites’ percussion on songs like “Submarines”. Ballads like “Slow It Down” perfectly balance out the solid collection of chorus-focused songs and feature Shultz’s raw, stripped-down vocals and brilliant songwriting. Every track will keep you hooked and leave you wanting more. The Lumineers have accomplished something rare in their debut album – a sound comparable to what you would expect only from a live performance. Tracks like “Stubborn Love” and “Flowers in Your Hair” will have you searching for the trio’s next live performance in your town. If you’re in Nashville, don’t miss The Lumineers at The Basement on Friday, April 27. So whether it’s for the hundredth time since last week’s release or for the very first time, go listen to the album, available on iTunes. It’s sure to be one of this year’s top Americana and folk rock debuts and the first of many for this group.